Islamist violence has been increasing in Bangladesh since 2013 after secular and atheist bloggers or minorities including Hindus and Shiites have been targeted by Al-Qaeda on the Indian subcontinent (AQIS) and neo-JMB, another radical Islamist group with an ideological affinity towards the Islamic State (IS). While the consensus among security analysts is that the violence stems from a radical jihadi nature, the secular Awami League government primarily blamed its bitter political rivals, the Bangladesh Nationalist Party (BNP) and Jamat-e-Islami (JeI) for the violence, cracking down on these opposition parties and using the violence to push for greater censorship. Ambiguities inherent in the definition of ‘terrorism’ has led to the broad use of counterterrorism tools to target the political opposition and general dissent. 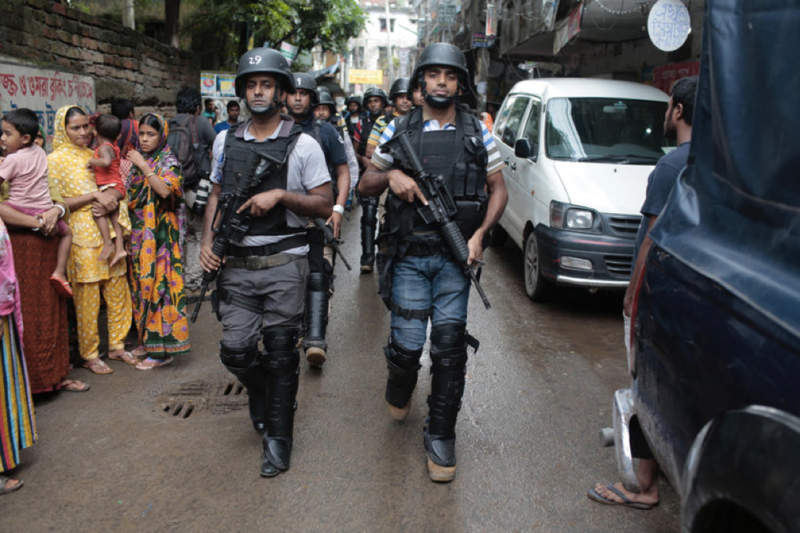 With its far-reaching scope, the Anti-Terrorism Act offers a legal basis to trial any dissenting voices who allegedly threaten the ‘solidarity of Bangladesh’. Compounding this problem is the politicisation of law enforcement agencies in Bangladesh. With both the BNP and Awami League relying on law enforcement agencies to strengthen their position, agencies are widely perceived to be politicised and inept. A majority of senior and mid-level positions are occupied by officers who have demonstrated their allegiance to the incumbent political party. In this light, the investigating capacity of security agencies is likely to be limited, and personal rewards for confessions of suspects might incentivize the use of blackmail or even torture. The government has also used the specter of terrorism to clamp down on internet freedom and the freedom of expression. In November 2015, citing militant threats, the government of Bangladesh temporarily blocked popular messaging services such as Viber and Tango. In a more drastic measure, Facebook was made inaccessible for 22 days until 10 December 2015. Moreover, the government approved a new digital security law that permitted law agencies to imprison any individual for spreading negative propaganda against former Prime Minister Sheikh Mujibur Rahman – the first PM of independent Bangladesh – on the internet. The law called for 14-year prison sentences for cybercrimes including cyber-attacks on government infrastructure. Bangladesh’s current cyber law – the Information and Communication Technology Act under which anyone publishing material ‘hurting religious beliefs or offending the state’ – has been used to target journalists, civil society groups and human rights organisations. When confronted with questions of proportionality, the Information Minister of Bangladesh Hasanul Haq stated that the ‘right flow’ of information was needed to stop the rise of militancy and propaganda. Earlier, the 2014 National Broadcast Policy approved the establishment of an ‘independent commission’ to oversee the content of electronic media in Bangladesh. under this, a Broadcast Commission will be set up that will prohibit independent news content that might tarnish the image of law enforcement agencies as well as the army. This effectively renders the government effective and final arbiter of media output. In 2016, the government issued a large-scale crackdown on alleged militants during which nearly 15,000 individuals were arrested. However, only 194 were confirmed to be militants linked to radical Islamist groups and reports indicate that members of the political opposition party BNP had been maliciously targeted. Disappearances and unlawful detentions of political activists have become routine in Bangladesh. They constitute a violation of due process and are a complete distortion of the country’s official counterterrorism legislation. According to human rights organisations, the interaction between law enforcement agencies and treatment of suspects are also puzzling. Over the first nine months of 2016, 150 people were killed during confrontations or during custody, and 95 journalists were reportedly tortured. However, abusing power and targeting dissent is unfortunately not new in Bangladesh’s volatile political system. When BNP was in power in 2002, it launched ‘Operation Clean Heart’ to counter proliferating crime. The operation resulted in the extrajudicial killing of at least 60 people, wounded about 3,000, and led to the arrest of more than 5,000. The then opposition Awami League claimed BNP had used the opportunity to target the political opposition rather than criminals. Today, the actions of the International War Crimes Tribunal (ICT), which was set up in 2009 to investigate the war crimes committed during the 1971 war, is resulting in bereavement and polarization in Bangladeshi society. Until now, the tribunal has indicted more than 57 individuals mainly from political rival parties such as JeI, and executed high-profile leaders such as its former vice president, chief financier or Secretary General. Although the executed individuals were likely to have committed involved human rights violations during the 1971 war, the perception that the ICT is a tool in the hands of the government to target its political opposition, particularly the senior leadership in order to weaken the opposition institutionally has let to wide-spread grievance amongst political activists. Moreover, such crackdowns have decreased the operating space for legitimate political opposition and increased radicalism and militant recruitment. Given that many political activists have been put in overcrowded prisons, there is a large possibility of them coming in contact imprisoned militants who are actively recruiting within jails. Bangladesh has witnessed at least a dozen coups since its independence in 1971. Compounding this problem is the zero-sum political rivalry between BNP and Awami League. Given historical political volatilities, the primary aim of any government in Bangladesh remains to secure its position and maintain its stay in power and to delegitimize or destroy any dissenting voices. The effect of such drastic measures on actual national security remains questionable. While the anti-militancy raids have resulted in a relaxation of attacks in and around population centers, the respite is likely to be temporary. Although terrorist groups are likely to have dispersed to peripheral Bangladesh due to the crackdown, dangers of further radicalization and recruitment in their ranks will only be made easier should the government continue to abuse its position and further polarize Bangladeshi society. Athul Menath is a security analyst at the South Asia Terrorism Portal (SATP). His focus is on counterterrorism policies in South Asia and the rule of law. Follow him on Twitter @loner/56.